Every single day in your life, you make personal decisions that take you in specific directions throughout your life. Things like, what am I going to wear or, what am I going to eat, or should I press the ‘snooze’ button on the alarm clock, seem very trivial and sometimes irrelevant when thinking about decision making. However, even those apparently ‘tiny’ decisions might have a HUGE impact in what your destiny ultimately is going to be. Let’s, for instance, take a look at the second decision mentioned above: What am I going to eat? I’m sure you certainly answer this question more than three times a day in our modern western world full of food offers. And the answer that you ‘consistently‘ give to that question, reflects decisions that can take you through a path of health and energy or down, through ‘Hell Alley’ in health terms. Think about the millions who suffer from being overweight, diabetes and most of the other civilization’s ailments. The MAIN factor in their ‘destiny‘ is intimately related to the decisions they make when answering that question several times a day: What am I going to eat? This goes to show that you don’t necessarily need to be the CEO of a big corporation, or even a Small Business Owner to have to face the making decision process regularly. It’s therefore very important, that you understand why taking the process of making decisions serious is for your own benefit, in the short, and in the long run. Since most of the articles about the DECISION MAKING PROCESS are aimed at Managers and CEOs. I decided to come up with something for the individual. Not based on complicated formulas and checklists, but more on practical stuff. I know I don’t plan my meals using them checklists. And many other decisions I make everyday, are made even without thinking much. The decision making process has only one purpose, which is to help you take the appropriate actions that will bring you closer to your ultimate goal. Therefore, it’s very important to, at least, know what that ULTIMATE GOAL should be or, what YOU want it to be. That means that you’ve stopped and thought about what you want to achieve. Let’s, once more, go back to the example of what to eat. The decisions that you make in this aspect of your life, will reflect what will ultimately be your destiny in terms of health and nutrition. For a lot of people, this is actually a non-issue, they don’t even consider food in relation to health in the long run. It’s more of a spur of the moment pleasure thing and, because of this fact, their ‘food’ decisions are based on mood or cravings of the moment. Humans are creatures of habit. Once a habit has been installed, a decision has been eliminated in advance. You don’t need to THINK anymore about that situation, you just react as a preprogrammed robot. This can definitely be used to our advantage, when we develop habits that work with us to help us achieve what we desire. On the other hand, there are habits that have been installed by others, that could work in detriment of your wellbeing. Are you aware of them? Let’s take, for instance, the case of smoking. Do you smoke? Did you make a ‘conscious‘ decision to smoke or was it something installed by others at a very young age? Maybe, by your peers and under pressure? Even though there is lots of evidence out there that smoking can be damaging to your health, I’m no one to judge you for smoking, if you do. My point is only to wake up AWARENESS in you concerning stuff that you do because you’ve always done it. Stuff you do because it’s a HABIT! There are other habits that seem inoffensive, but are not necessarily beneficial. They have probably not been installed by others. We might just have fallen in that particular routine of doing things. Again, not trying to judge, just trying to bring your conscious attention to habits that you might have. Take the time to take a look at your habits and find out if they’re working with you or against you. Only you can determine that, based on the first point above: What do you want it to be your destiny? When confronted with the need to make a decision, we will automatically use our past experience to evaluate the circumstances and see what the possibilities are. If a similar situation is linked to bad experiences in our past, we might either avoid the decision or try to decide against it. One thing that you need to keep in mind is something that Tony Robbins constantly repeats in his seminars: “The past does not equal the future”. Which means that, even though you might have had a bad experience in the past, let’s say in the realm of relationships, it doesn’t mean that every relationship you have in the future will be exactly the same. In fact, every relationship you have is going to be different because, at least, one of the members of that relationship will be a different person. That makes the equation completely different, even though they seem similar. 1 + 2 is not the same as 1 + 3 although both are addition problems. Do you see my point? So, when confronting decisions, use your previous experiences wisely, but remember that even though situations are ‘similar’, they’re not the same, and the different variables might make this particular instance have a completely different result than anything you might have experienced in your past. We’ve heard it a thousand times: “Nobody is perfect” and the point is, IT’S TRUE! So, you WILL make BAD decisions. There is no way to avoid that. 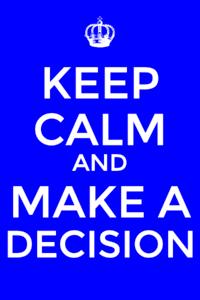 Remember that, even making NO decision at all, might be a BAD decision in the long run. How do you react when you suddenly discover that you made a bad decision? Is it the end of the world? Well, it depends on the decision you made. But for the majority of the people, it’s not. Obviously, I’m not talking here about decisions about committing crimes. Those are definitely BAD decisions and might mean the ‘end of the world’ for the person making them. On the other hand, if you think of people like Nelson Mandela or even the Founding Fathers of the United States, you’ll remember that their most important decisions were considered ‘crimes’ at the time. So, even what a ‘bad decision’ is, can be debatable. The point is that you need to understand that bad decisions will be made and you should learn to live with them and move on. When that happens, learn from your mistake, take responsibility, make the necessary amends and, if possible, change what you’re doing to produce a result that’s more akin to what you expect. This is related to the previous point and, actually, could be part of it. I decided to separate it, because it’s something that makes people FEAR making decisions. When you ‘fail’ in your decision making process, find the lesson that can be learned and move on. Imitate Thomas Alva Edison in this aspect. The word ‘DECIDE‘ comes from the Latin ‘DECIDERE‘ that literally means ‘to cut off‘. This can give you perspective when you make a decision. You’re actually NOT picking one option from a group of options available. In reality, you’re ELIMINATING or CUTTING OFF the other options until only one remains. This means that you should commit to the decision you’ve made and should do your best to make it work. In “Think and Grow Rich“, Napoleon Hill mentions the example of Henry Ford as someone who was fast to make decisions and slow to change them and that was the reason why Henry Ford was a successful entrepreneur. Obviously, your decisions should be made taking the different principles mentioned here into account. Before I leave this point, let me mentioned one example of making a decision by ‘cutting off’ the other options that gets done very, very regularly, namely, the decision to share your life with a particular person by marrying them. This is a decision that, if it’s to prosper, requires the cutting off of all other options. Not that it always happens though! But only when that’s the case, a marriage has a chance of really succeeding. The same thing with any other decision you make. By cutting off all other options and committing to the one you’ve picked, you will increase your chances of success exponentially. There is no way to COMPLETELY eliminate emotions from the decision making process. In fact, according to discoveries by Antonio Damasio, emotions are an intrinsic part of decision making. If you don’t have emotions, you CANNOT make decisions. You’ve probably seen it. You’re helping somebody make a decision, you know, like maybe your significant other or better half, and in the end, even though you present logic and facts, they end up making a decision based on their ‘feelings‘. It might seem completely out of logic, but there is scientific proof that this is the way it is and, it’s unavoidable. The problem is though, that some people get completely swamped with the feelings part of making decisions, that their fears don’t allow them to make any decisions. What happens in the end, is that others end up making decisions for them or, circumstances become so ‘urgent‘ that they have to just go with the flow. If this happens regularly, they will end up in a place much different from what they might have wished. Don’t let something similar happen to you. “Never leave the place of a decision without having taken some action in its direction“. This is wise advice because it immediately starts building momentum in the appropriate direction. Never forget that whenever something is DONE, you will get a result. And if you get a result, this will improve your belief in yourself and your decision making. To become a decision maker that takes the lead of his or her life, you have to be a courageous person. Given that some of your decisions will be bad, you might have to suffer the consequences of what happens after results start to happen. Nobody knows the future and there’s no guarantee that everything is going to be smooth in your decision making process. This doesn’t mean that you should stop being proactive and making decisions. Even if you DON’T do anything and don’t make any active decisions and even if you don’t take any positive action, there is NO GUARANTEE that everything is gonna be alright. So, why not increase the chances of obtaining what you want by causing changes in your circumstances through making decisions independently of what could happen? If you take the other options into account, chances are your decision making process will bring you more successes than failures. This is a big one. Should you trust your ‘gut feeling’? Successful people claim to do this all the time. Even when logic and facts point them in one direction, if their gut feeling points them in another, they might go with their gut feeling. This gut feeling is also called intuition, and some people are very good ‘in tune’ with their gut feeling. My mother had an aunt, for instance, that had a VERY GOOD relationship with her ‘intuition’. Her ‘gut feeling’ or ‘inner voice’ as she called it, saved her from snakes in the jungles of Venezuela when she was a little girl, and from a traffic accident that claimed the life of her best friend in France, as an adult. It even ‘told her‘ NOT to go to a bomb shelter during World War II when she was living in Marseille, France. In the end, she managed to live 107 (1897-2004) years and died in peace from old age. The thing is, not everybody has that ‘fine tuning’ or ‘relationship’ with their gut feeling or intuition. If you’re one of the ones that doesn’t have a history of listening to your gut feeling, you need to train yourself and start ‘paying attention‘. You also have to train your ‘mindset‘. Are you a someone with a mainly positive mindset? Or with a mainly negative mindset? I’m of the opinion that your main mindset inclination will influence what your gut feeling tells you. This is why it’s important to train your mindset appropriately. Then, you can start trusting your gut feeling in small things and slowly go from there to bigger decisions and, please, remember the other points and take them into account. 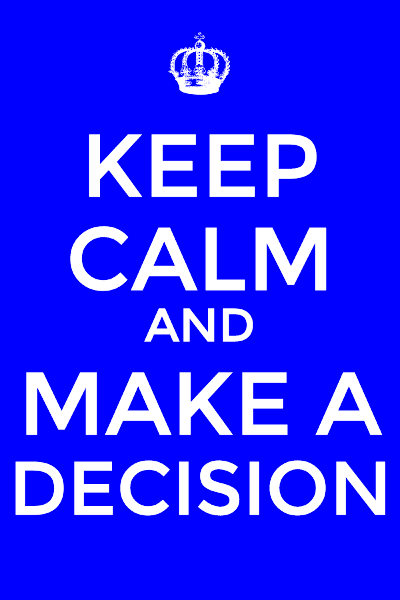 You make decisions every day, whether you like it or not. Your decision making process is affected by many things around you. Facts and Logic, as the base for the decision making process, should be tempered with what you really want to achieve in the long run with your life. You will make some really bad decisions at some point, but being flexible and courageous will help you learn your lessons and move on, instead of dwelling on your mistakes forever. Let your gut feeling and emotions play their role in your decision making, but don’t let them fill you so much with FEAR, that you cannot make any decent decisions anymore. And, in the end, as soon as you make a decision, TAKE SOME ACTION in its direction to start seeing results fast.